The first two installments recounted Ulysses S. Grant’s trip to McKean County Pennsylvania on Nov. 16, 1883. 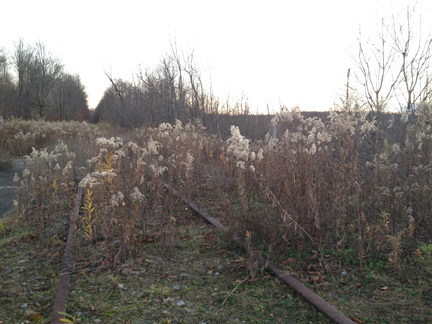 The purpose of the trip: to visit the Kinzua Viaduct. Author Chris Mackowski originally hails from McCounty. Grant appreciated the natural resources in other ways, too, commenting on the state’s coal and iron fields and oil territory. “Pennsylvania is one of the most wonderful states I ever saw,” Grant said. The newspaper correspondent discovered “the proverbially close-mouthed hero, whose belief has always been in deeds, not words,” turned out to be positively loquacious. Perhaps the correspondent didn’t know of High Bridge, near Farmville, Virginia, which stood along Robert E. Lee’s route of escape to Appomattox from Petersburg and Richmond. The bridge ran some 2,400 feet long—a few hundred feet longer than the structure Grant was about to visit near Bradford—and rose some 125 feet high—high enough, for sure, for soldiers of both sides. 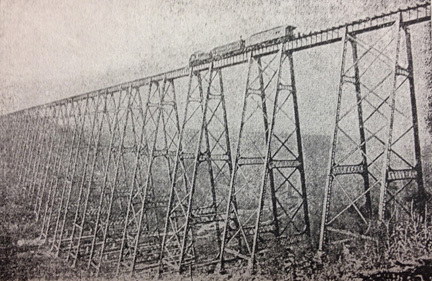 The Kinzua Viaduct, though, rose more than twice as tall. Grant’s visit, for all its ballyhoo, did not last long. When his train arrived at “the big bridge,” Grant disembarked and, with cigar in hand, walked about 200 feet out. He “peeped over the rail into the yawning chasm,” the correspondent reported. Coming from Bradford, Grant would have approached the Kinzua Viaduct from the north—but today, that section remains inaccessible because of the storm damage. Jackson and I, in our commemorative trip, have to circle around and approach from the south. A third of the bridge still stands. 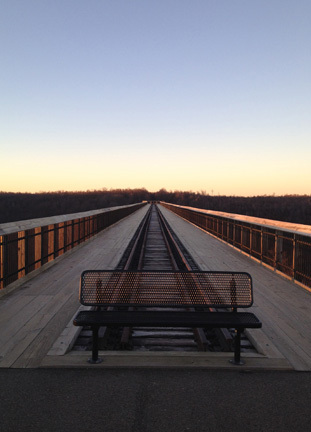 A $4.5 million post-storm rehabilitation project reinforced the remaining spans and converted the railbed into a skywalk. The sheered-off end was capped with an observation deck with a reinforced glass bottom. Visitors can look over the railing at the fallen towers or straight down through the floor to the valley bottom hundreds of feet below. To the west, the sun sinks toward the bare-treed mountains, brown and empty. From this height, it looks like a forest of porcupine quills. To the east, the long shadow of the bridge reaches up the valley, all the way, and spills upward against the next mountainside the way a wave throws itself against a breakwall. The shadow seems literally a mile long. With cigar in hand, I walk out onto the bridge only 200 feet or so and look over the edge. Jackson looks, too. We’re not even at the bridge’s tallest point, yet the height is dizzying. Jackson and I—we stay longer at the bridge. We watch the sun, brilliant as an egg yolk, crack the horizon, and all the radiance drains from the sky. Shadows rise from the Kinzua Valley below, filling in the spaces between the dark brown tree trunks. We arrived alone, but by the time the sun vanishes, two couples have joined us for the sunset, as has a family of five. The three kids are small. The oldest stands on the plate glass and gapes downward while the middle child, facing him, jumps up and down to test the glass. Everything holds but my cigar smoke, which wafts off to the west. Near the parking lot, construction continues on a new visitor center for the state park. Bird Spencer had hoped Grant’s visit would bring enough publicity to the viaduct that it would become a tourist attraction. While it did achieve worthy notoriety in its day, attracting as many as 160,000 visitors a year, only now that the bridge lies crumpled on the valley floor does it seem to merit enough funding for a visitor center. The $6.9 million project, originally slated for completion this fall, is running a little behind schedule. The outdoor exhibits highlight the bridge’s construction and destruction, emphasizing nature’s power. Grant, once the most famous man in the world, goes unmentioned. Parts of Virginia still remember the storm he brought with him as his army swept through in 1864 and 1865, but here at the Kinzua Viaduct, it’s the storm of July 21, 2003 that gets remembered. That date—July 21—has echoes of Grant, too. He died of throat cancer on July 23, 1885, just three days after finishing his memoirs. When Grant came to the bridge, he had less than two years to live. The Kinzua Viaduct would outlast him by 118 years, almost to the day. 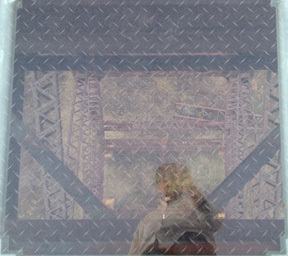 The restoration project has given the bridge new purpose, but beyond the skywalk, the old railbed still cuts through the woods, running away from the bridge. The gloaming closes in. The tracks disappear. The Papers of Ulysses S. Grant. John Y. Simon, ed. Carbondale, IL: Southern Illinois University Press, 2009. Pg. 335. Ward, Ferdinand. “My Recollections of General Grant.” New York Herald. Dec. 26, 1909. Ward, Geoffrey C. A Disposition to be Rich: How a Small-Town Pastor’s Son Ruined an American President, Brought on a Wall Street Crash, and Made Himself the Best-Hated Man in the United States. New York: Alfred A. Knopf, 2012. Pg. 228. The Bradford (Pa.) Era. “Hail to the Chief.” Nov. 16, 1883. The Bradford (Pa.) Era. “Gen. Grant.” Nov. 16, 1883. The Bradford (Pa.) Era. “Homage to Gen. Grant.” Nov. 17, 1883. The McKean County Miner. “Ex-President Grant in Bradford.” Nov. 16, 1883. The McKean County Miner. “President Grant’s Visit to McKean County.” January 11, 1926. Reprinting an article dated August 16, 1869, that appeared in the Sept. 2, 1869 edition. Thanks, too, to Linda Devlin, executive director of the Allegheny National Forest Visitors Bureau, who confirmed some of the details about Kinzua Bridge State Park and the new visitor center there. Statistics on the building come from the Pennsylvania Department of Conservation and Natural Resources. This entry was posted in Leadership--Federal, Reconstruction and tagged Bradford, Ferdinand Ward, Grant at Kinzua, Kinzua Bridge, Kinzua Viaduct, McKean County, Ulysses S. Grant. Bookmark the permalink.